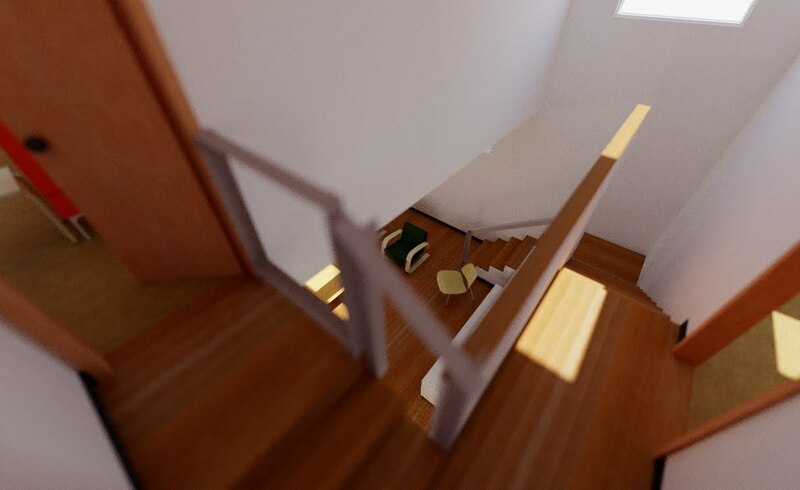 We explained in an earlier post how the XHouse3 has this unique split level second floor, where the two bedrooms are at the top of the stair, and the master suite another few steps up. This raised master bedroom provide for a couple of feet bump in the height of the ceiling in the living room and kitchen setting it off as the center of life in the house. From that juncture of the few steps up to the master we can take it all in - master bedroom door to the left, peering down to the living room at the center, and the stair landing at the bedrooms on the right. Can you see it?